The Sims FreePlay Team has released an official schedule of new events and reruns that will be taking place in The Sims FreePlay throughout the end of April, May and the first 6 days of June. Check out their official announcement of the new events and their dates down below! Hip, hip, hooray! Get ready to have some serious fun, because the latest update has everything you need to throw the ultimate kids’ party. Live the ultimate childhood extravaganza as you tap into your inner child during the Inner Child’s Play Seasonal Quest and unlock a fantastic kids treehouse, large enough for even you most grown-up Sims to enjoy! Party bags, junk food, and a wheelhouse of games! 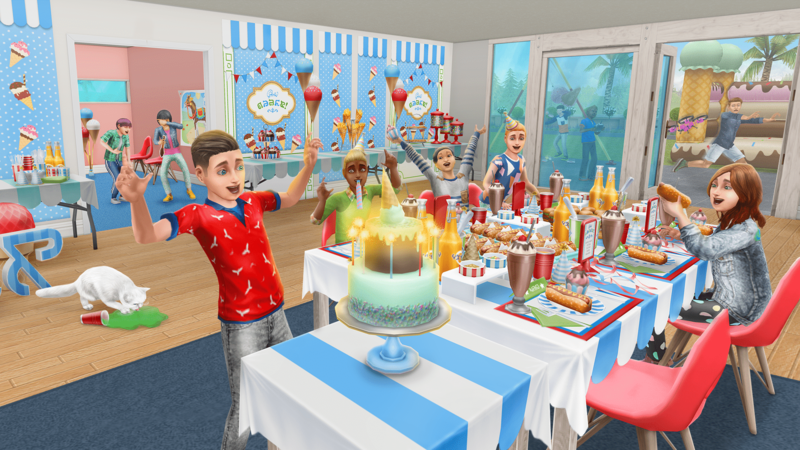 Create the perfect pre-teen party in the Kids Party Live Event, revealing a bounty of dazzling decorations along the way. Complete the live event to unlock the grand prize: a dream Kids Party House Template with an enormous bouncy castle! I need help with this quest. My sim left crystals house before preparing food (so I could send a sim who can cook). Now crystal is missing and I can’t find a way back to her house.